The number of Hispanic workers in the U.S. construction industry has been steadily increasing, and language and cultural barriers have sometimes arisen on the jobsite. Due in part to these barriers, the number of fatalities among Hispanics at construction sites in 2001 jumped 24%, while construction fatalities overall dropped 3%. This study, which constitutes Phase III of the Hispanic Workforce Research Project, addresses these language and cultural barriers by investigating the most effective way to deliver training material developed in Phases I and II to Hispanic workers, American supervisors, and department of transportation (DOT) inspectors. The research methodology consisted of assessing the needs and interests of potential and current course participants in terms of exploring innovative ways to deliver the training. The training courses were then adapted and delivered to fit the specific needs of each audience. During Phase III of this project, the research team delivered the courses described in the Phase I and II reports to eight highway construction companies and two DOT groups. 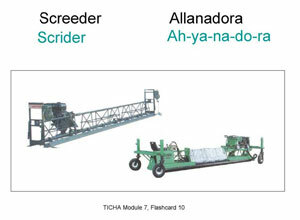 The courses developed in Phases I and II consist of four construction-focused language training courses that can be part of an effective training program to facilitate integration among U.S. and Hispanic workers, increase productivity and motivation at the jobsite, and decrease the existing high mortality rate for Hispanic workers. Moreover, the research team developed a course for the construction season called Toolbox Integration Course for Hispanic workers and American supervisors (TICHA), which consists of nine 45-minute modules delivered to one construction company over 11 weeks in the summer of 2005.